Based on years of academic and industrial research by an international panel of experts, Chemical, Biological, and Functional Properties of Food Lipids, Second Edition provides a concise, yet well-documented presentation of the current state of knowledge on lipids. 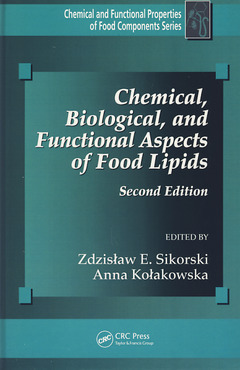 Under the editorial guidance of globally recognized food scientists Zdislaw E. Sikorski and Anna Kolakowska, this completely revised and updated edition presents eight entirely new chapters. Chemical, Biological, and Functional Properties of Food Lipids, Second Edition is an ideal reference for both professional and aspiring food scientists in both industry and academia. It contains all of the necessary information needed to control the rate of undesirable reactions in foods and select optimum storage and processing parameters for these delicate fats. The Role of Lipids in Food Quality. Lipids in Food Structures. Nomenclature, Structure, and Properties of Lipids. Rheological Properties of Lipids. Phospholipids. Cholesterol and Phytosterols. Fat-soluble Vitamins. Lipid Oxidation in Food Systems. Lipid Analysis. Role of Lipids in Nutrition. Plant Lipids and Oils. Fish Lipids. Milk Lipids. Egg Lipids. Modified Lipids and Fat Mimetics. Frying Fats. Lipid-Protein and Lipid-Saccharide Interaction.